How Location Aided Handover, target cell for handover, high data rate, cell for handover, handover algorithm, handover procedure, handover. This figure clearly shows that the LAH algorithm exploits information both from Location Server (LS) and the Mobile network Geographic Information System (MGIS) so as to make the decision of the most appropriate target base station for handover. The LAH Algorithm will as a whole identify critical areas, monitor user movement and take intelligent handover decisions, in order to prevent different network shortcomings related to handover procedure. Concerning the use of high data-rate services at mobile terminals it will be essential that the network is able to predict the target cell for handover well in advance in order to reserve the required resources. This kind of mechanism will be enabled by LAH, and consequently, the concept is extremely attractive for UMTS. The handover performance is improved in two ways. First, the MGIS data can be used for the neighbor cell planning. By analyzing the MGIS data it is possible to detect areas where the handover success rate is low. In these areas the adjacent cell assignment may not be optimal. Moreover, it is possible to use the mobile phone location capability, in other words we can make use of the Location Server (LS), to aid the actual handover algorithm. This is a clear advantage over the existing solutions, which are based only on the signal level observations. For example, the handover could be delayed if the mobile would be detected as moving along the border region of two cells. This way the “ping-pong effect” can be avoided. Also, if there are several neighbors to choose for target cell, the information of location may help to make the optimal choice. Another example is the special “far-away cell” problem, which has been observed in hilly areas by a lot of mobile operators. The mobile may be connected with a faraway umbrella cell and the other cells close to the mobile are not allocated as neighbors to the connected cell. In this case the location information could be used to determine the correct target cell for handover avoiding the restrictions of the neighbor assignments. Since handover is one of the major parameters that usually influence the stability of a cellular network, the maintenance of accurate location-related information in the MGIS can lead to a more effective adjustment of the handover parameters and the algorithm itself. As a result, some working assumptions on the available location accuracy will have to be made. These assumptions will be established based on a location techniques evaluation. Standard methods, such as the E-OTD, TOA and GPS-assisted will be considered. Also techniques not yet under standardization, such as the database correlation method will be investigated. 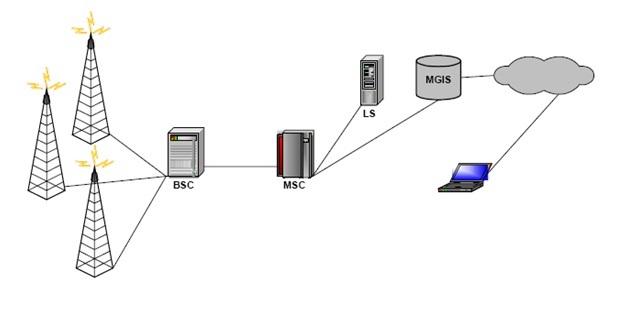 The major benefits from the above described use of the MGIS data for efficient handover procedures are to decrease signaling traffic, avoid drop calls, increase speech quality, solve several planning shortcomings and enable seamless handovers for high data-rate users in UMTS by providing a mechanism for resource allocation in the target cell.